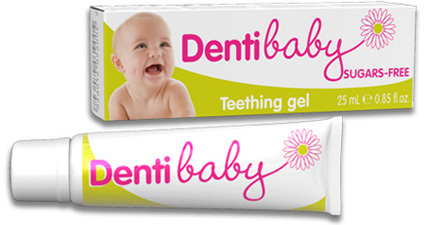 Massage teething gel should be used in the event of gum pain related to teething in babies. It has been tested under paediatric supervision and manufactured under pharmaceutical supervision. Formulated with emollient and softening Camomille flower extract, and soothing Propolis, massaging DENTIBABY teething gel into the gums helps your child get through this uncomfortable time. Camomile flower extract 5 %, Valerian root extract 5 %, Propolis extract 5 %, excipients q.s. 100 %. SUGARS-FREE. Tube of 25ml. Wash your hands thoroughly. Apply a small amount of gel to a finger and lightly massage the painful gum for 2 to 3 minutes. You can repeat the application until 5 times a day. Suitable for pregnant and breastfeeding women. This regulated health product is a medical device which bears the CE mark in accordance with this regulation. Ask your pharmacist for advice. Please read carefully the lealfet. HOW TO RELIEVE BABY’S PAIN? There are lots of ways to soothe your infant when he or she is in pain. Before resorting to medicines, there are some natural and safe remedies that can help calm your baby down. Massaging your baby’s gums with a teething gel is one of the best ways to relieve teething pain. Opt for a gel made with natural ingredients that will tone the tissues while safely soothing the pain. Please note: you should never attempt to force the tooth to pierce the gum line: this could cause an infection.